Significance of animal husbandry is underestimated in our cities so fare specially in developing countries and emerging economy. Cattle are often an important source of food security for urban poor and source of healthy diet for health conscious upper class segment of the society. However if practiced seemingly in unorganized manner as frequently ignored by authorities not even its potential that it entails but the risks it bears while considering planning and infrastructure support for urban planning and development. On the contrary it is regarded as public nuisance. Many migrants in search of livelihoods from rural areas have brought their animals into the cities as living inventory, and sometimes even as their only possession as this enables easy market access, which in turn, reduces transportation costs and add to profits, many a times it’s vital for their survival. The animals represent important link to their home locations. In recent times urban elites especially middle class discovered the urban animal husbandry as an interesting investment options. As the animal production takes place mostly in subsistence level and in the informal sector the figures on how it contributes to economic growth of the city and provide food security to urbanite especially urban poor are not available. Livestock keepers, migrants from rural areas mostly have settled in informal settlements in cities, often they own little or no land. The lack of infrastructure and non-availability of pasture lands makes this occupation vulnerable resulted into lower production and inferior quality of livestock breeds. They are fed on both cattle feed and fodder purchased from the market and food wastes from institutional kitchens. They graze on waste lands/pasture lands and green spaces nearby around the city areas. Most often livestock keepers free their animals both productive and non-productive animals in the city to roam around where animals tend to find feed from wastes hips in the city. Uncontrolled food intake and lack of infrastructure put them in health risks due to toxic substance and exacerbate public health hazards as the transmission of zoonosis, vector-borne diseases, occupational health hazards and environmental pollution, as well as compromising animal welfare. It requires serious attention from authorities to provide policy framework in urban planning and infrastructure support to flourish urban animal husbandry economy in the cities. Gujarat is one of the largest milk producing states in India with the contribution of 7.75% share in the total milk production of India . The estimated contribution of livestock sector in total GDP of Gujarat during 2015-16 is about to 5% to 5.5% and its share in GDP of agriculture & allied sector is approximate 25% . In spite of well-established dairy sector across the States, Urban animal husbandry remained ignorant in getting state’s support in terms of policy and programmes as cities are never considered to be a place of primary production. 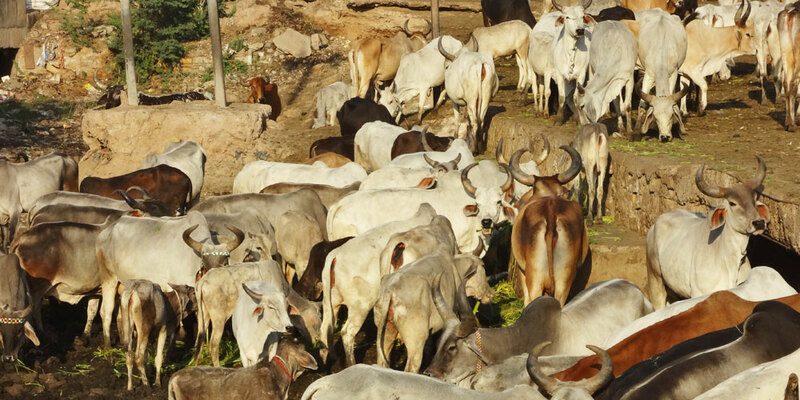 In Gujarat, the State government’s Gau Seva Ane Gauchar Vikas Board has for the first time considered proposal for establishing an Animal Hostel to scientifically manage 500-750 animals. It will help city to plan and allocate space for animal homes to deal with menace of stray animals roaming around the city and minimize waste management costs. The Animal Hostel can have provision for animal shelter, water facilities, storage of dry fodder, milk processing facilities, an outlet for milk and milk products. The cow dung can be converted into cooking gas and supplied back to the owners’ homes. There will a provision for collection of cow urine that can be supplied as source of nutrient for agriculture. Setting up animal hostels will ensure a clean production system, direct contact between consumer and producer cutting down the costs of value chain production in dairies ensure the removal of animals roaming around in the city, recycle our kitchen food waste as fodder for animals, and better health and living conditions for the animals. In Bhuj, large number of cattle owners is engaged in milk production and serve a considerable number of citizens. Sahjeevan, civil society organization working on urban environmental issues have organized livestock keepers of Bhuj city to form their association to strengthen clean milk production and value chain in the city and initiate dialogue with administration for their basic rights. It also helped Bhuj Municipality to prepare proposal for pilot project of Animal Hostels under the housing for all project with financial support from State Animal Husbandry department and Gau Seva Ayog. While working with Sahjeevan, I found cattle owners and their animals are living in a pathetic condition in the slums of Bhuj city. As cattle owners live in informal settlements they lack basic amenities and legitimacy from the authorities leading to bad management of their animals.